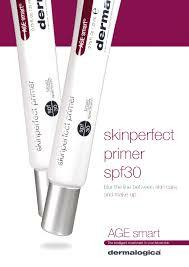 Dermalogica’s Skinperfect primer spf30 has literally been flying off the shelves and I can see so many reasons as to why! Primers are primarily used as a make-up base. Primers are typically worn over your prescribed moisturiser and under your makeup. They help to even the tone and texture of your skin smoothing out the surface for a better application of your makeup and longer lasting coverage! Dermalogica however have nailed it once again with this beauty of a product and it is simply amazing! Not only does it cover the cosmetic benefits of a regular make-up primer but it is also a skin treatment primer with three added benefits! 1-Promotes a radiant even skin tone creating an instantly smooth surface with its velvety silicone’s within the product. 3-As part of the AGE Smart range it contains powerful peptides to help stimulate collagen production and help to shield against environmental factors that can lead to skin ageing.